Reading a_y_b’s piece on National’s policy talks with the Real Estate Institute I’ve got to say it struck me as having shades not so much of the Brethren fiasco as the leaked Insurance Council memo from the last election. According to a letter given to Labour’s Clayton Cosgrove by a member of REINZ, the real estate lobby and National have been secretly discussing policy to roll back consumer protections in favour of the industry. Sound familiar? 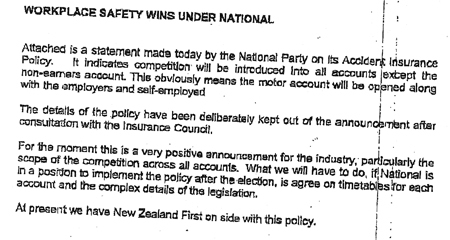 You may recall in 2005 National was busted for secretly meeting the Insurance Council and colluding on (possilbly even selling) policy, which was then deliberately withheld from the public as they knew it would be unpopular. The full memo can be found here (PDF, excerpt below). 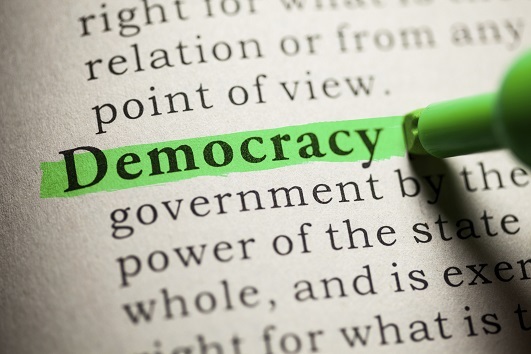 If National were willing to go behind closed doors and sell New Zealanders out to industry lobbyists on ACC last election, what reason do we have to believe they won’t sell us out again this time on consumer protections? Unless National comes clean or is found out again we can’t know for sure whether Cosgrove’s allegations are true, but they certainly go a long way to explaining why National is being so cagey with the public over its policies. I’m sure that ACC is a target this time around too. Anything where an insurance monopoly provides better cheaper service to NZ will be opened up to “competition” so a few wealthy donors can pay less for insurance and the rest of us pay a lot more…..for less. Mindful of the electricity “reforms”. That worked the same way with the same result. ‘possilbly (sic) even selling’ – link please. Been waiting to prove that John Key is corrupt. Now you have done it – I just need the link to prove to the Nats at work! There must be one – surely?